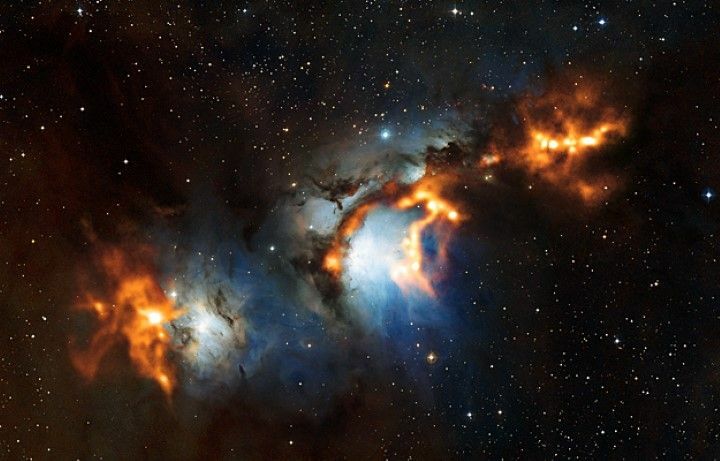 A new image of the region surrounding the reflection nebula Messier 78, just to the north of Orion’s Belt, shows clouds of cosmic dust threaded through the nebula like a string of pearls. The observations, made with the Atacama Pathfinder Experiment (APEX) telescope, use the heat glow of interstellar dust grains to show astronomers where new stars are being formed. In the centre of the image is Messier 78, also known as NGC 2068. When seen in visible light, this region is a reflection nebula, meaning that we see the pale blue glow of starlight reflected from clouds of dust. The APEX observations are overlaid on the visible-light image in orange. Sensitive to longer wavelengths, they reveal the gentle glow of dense cold clumps of dust, some of which are even colder than -250oC. In visible light, this dust is dark and obscuring, which is why telescopes such as APEX are so important for studying the dusty clouds in which stars are born. The APEX observations used in this image were led by Thomas Stanke (ESO), Tom Megeath (University of Toledo, USA), and Amy Stutz (Max Planck Institute for Astronomy, Heidelberg, Germany). For more information about this region as seen in visible light, including the recently discovered — and highly variable — McNeil’s Nebula, see eso1105 (http://www.eso.org/public/news/eso1105/).